As a thank you to my newsletter subscribers, I've decided that every month I'll be hosting a contest just for them. 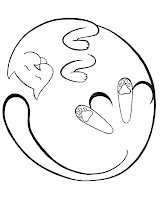 September's contest will be for the funniest original cat photo, and the winner will get a $20 gift certificate for whatever strikes their fancy in the PurrPrints shop, so sign up now to join in on the fun (the subscription box is in the upper left corner of this blog). Anyone else want a central location for finding exclusively etsy giveaways? I should start with this confession: I am, at heart, lazy. I'll watch a mediocre show rather than search for a lost remote or eat a lukewarm meal rather than find the waitress to ask that i be warmed up. This same principle applies to finding giveaways--I love them, I love entering them, (I'd really love winning them, though thus far no luck), and I especially love it when the prize is a neat handmade item from a fellow shopkeep on etsy. What I don't love, however, is finding them. I'm eager to find my next handmade project idea. 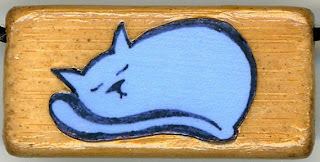 My sister has suggested I make either custom tags for cat collars or custom cat charms for charm bracelets. Both of these sound like fun, but I'd like to gather my ideas from a wider pool. 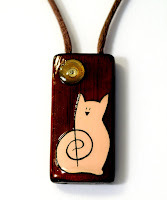 So here's the deal: you leave a comment with your honest opinion on the kind of item you'd be most likely to buy with a PurrPrints design on it, and whether you'd want it for yourself or as a gift to someone else. Pretty pretty please don't offer generic "I've seen people do well selling this" kinda suggestions; I'd much rather know what you'd really want (don't worry, I absolutely SWEAR I will not leave personal messages for any of you suggesting you buy it if I implement your idea). In exchange for your help with my "market research" you'll be entered in my giveaway for a FREE PRINT of your choice (any size from ACEO to 8 x 10, any design). You can enter a second time by posting about this giveaway with a link back to my post (don't forget to leave a comment with the url where I can find your post so I know to enter you twice!). The contest will run until midnight Sept. 15th; I'll announce the winner on my blog Sept. 16th. If I get over 10 entrants I'll also be awarding 2nd and 3rd place prizes (ACEO or 200 EC credits, your choice). Ideas to consider: charms/charm bracelet, cat tags, cat toys, journal/notebook, bookmark, calendar, clothes (specify kind), bags/purses, keychain, stickers, buttons, painted coiled rope bowls, original art in ___ price range, anything in ___ price range, or other (please specify). Okay, so it may seem just completely self-serving for me to make a request like that; obviously I sell my handmade goods. Yes, I'll admit it, I'd be delighted if I had a giant rush on my items for gift-giving--but that's really not why I'm writing this post (Okay, maybe 5% of why--but not my main reason. Just hear me out). Why am I suggesting buying handmade then? And why blog about it now, several months before the biggest shopping months of the year? Honestly, it's because as I was randomly dropping in on blogs today I noticed one that was telling people about a site to find all the "Black Friday" deals before Christmas, and it just made me sad. I used to work retail, and I worked on so called Black Friday. I can't count the number of desperate women, dragging upset children and disgruntled relatives, I encountered on this busiest shopping day of the year. Their faces were always drained and creased with the effort of getting up early (just after a day they probably spent slaving over food and visiting family, no less) to try to catch all the best deals in the stores for their holiday shopping. I understand the need for a deal (believe me--I'm living primarily on a grad student stipend right now), so I'm not just suggesting everyone abandon their holiday budgets and buy the most expensive specialty handmade items they can find. But prior to finding etsy, I never realized it was possible to find quality hand-crafted items for so frickin CHEAP. Yes, it requires a little looking--finding the stores with sales, or introductory low offers, or things like that. But i find looking through lovely pictures online whenever I want to sooo much more enjoyable than marching around through Target and the mall and Sears and ever other Black Friday special store the day after Thanksgiving. And when I buy handmade, I get the added benefit of knowing the actual person my purchase is helping out, even if it's just through a brief emailed exchange. I get to give my family and friends something really special, something they couldn't have likely found on their own just by showing up at the same box store I did. But anyway, enough with my soapbox. I've decided all my gifts this year will be handmade, either by me or someone else whose work I admire. Care to join me? Now that my struggles with glaze are sufficiently resolved, and I was able to get some photos of my new pendants that I was actually okay with (you have to be picky about these things on etsy--there are so many awesome product photos on there! To be honest, I'm still not completely satisfied with mine...), my necklaces are finally going up in my shop. Okay, okay, I guess it's a bit premature to expect all that stomping and cheering. Anyway, some of these are in the store already, some are ones I haven't listed yet (I'm spacing it out to one new listing a day). 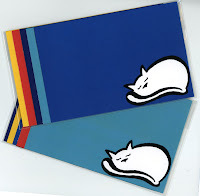 However, if you see one you want and it's not in my store, by all means feel free to contact me--no waiting required (unless you're into that kinda thing, that is). 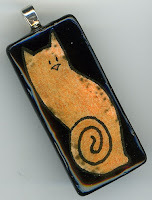 * The artwork on each pendant is a miniature of one of my original drawings. * Each piece of art has been carefully hand-cut (and, in some cases, hand-colored) by me. * Each pendant is glazed for added shine and durability. * The pendants are all strung on a lovely satin cord with pretty chinese button knots and overhand loops to fasten them in the back. * Most of the pendants are made with bamboo, a very eco-friendly woody grass with lovely grain patterns. * 15% of the sale price on any of my chokers that sell by Sept. 1st will go to an animal charity--specifically team efa's animal charity of the month. Comments, ideas, advice, critiques, questions, and anything else you can think of (other than just unproductive hateful bile--but I just don't suspect that will be an issue with any of my lovely readers) are always welcomed. So ColoradoCatnipToys and I arranged a trade on etsy (trades: one of the reasons to love etsy). She was interested in these cat cards and I was interested in her adorable catnip quilts. So she kindly suggested a trade and I eagerly agreed. Tonight (after very fast shipping) the quilt arrived and I pulled it out. She'd also included one of her handmade catnip toys as an added goodie for the kitties, and boy were they happy about the whole package. Below is just a little of the fun that followed. <--Allie Mae thought the blanket should be all hers. Note: Just in case anyone was wondering, this post was not at all sponsored or cajoled--it was purely inspired by how much my cats loved these items and the cute pictures that produced. Any time I do write a review that has been sponsored or arranged for through anything other than sheer delight I'll be sure to let my readers know--but I also won't ever write a review that's less than honest because without my integrity what good am I as a blogger and artist/crafter? After hearing tons of other shop-keepers on etsy praise RevolutionMoneyExchange (usually referred to as just "RME") to the heavens, and after doing a bit of research on my own, I've decided to join in on this particular free-us-from-PayPal-fees revolution. My biggest incentive, honestly, was when I had 33 cents of a 1 dollar shipping bill taken out by PayPal in fees earlier this week. Stuff like that is enough to drive a small shopkeeper nuts! Obviously, then, the perk of RME is its freedom from fees--no costs for signing up, requesting, sending, or receiving money. (There are fees for overdrafts and paper checks though--but since neither of those is an issue for me, that didn't put me off). Basically it's that you can only transfer money between RME account users--unlike PayPal, where non-account-holders can just use credit cards to pay. This means that if the person paying you doesn't have an RME account they'd have to set one up to pay, and then it will be a couple days before their account clears and money is transferable. (In other words, its work basically how PayPal works when you're not using credit cards--if there is money in their account, it transfers immediately; if it's being pulled from their checking first, there's a delay). Also, it only works for people in the U.S. currently (which I think is very unfortunate). Yes, that's a bit annoying. But to me it's far less annoying than paying 33% in fees (I know, that's only a bill for 1 dollar, but still!). In order to make it more appealing to my customers, I'm thinking I'll either include a free extra with purchases made through RME or I'll offer a 2% discount (PayPal charges 3%, but they also have a flat 30 cent transaction fee they add to this 3%, which is what makes those low-priced-item transactions on PayPal so brutal, fee-wise). What would you find to be the best incentive? 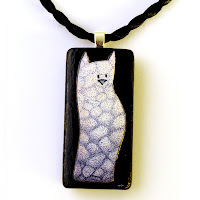 I'm in the process of expanding my PurrPrints designs into a line of pendants and I'm consequently learning the joys (or, so far, mostly the exasperated sighs) of glazing. So I thought I'd share a few glazing don'ts for any other glazing noobs out there. 1) Don't let the piece dry in a vertical position. If you do, you're likely to get some ugly lumps where the glaze has gathered at the bottom of the piece. This, of course, was how I was initially drying my pendants (I'm sooo brilliant, oh yes). 2) If you do get lumps in your glaze, don't try to sand them. Especially don't ignore the advice of a more experienced pendant maker who says "sanding doesn't work so well" and proceed, willy nilly, to try to sand it anyways because darnit you just can't stand those ugly lumps and maybe, even though you've never sanded glaze before, you'll somehow discover a magic way to make it work. Right. Five minutes later you end up with a result that is much much uglier than the lumps (see that nasty spot in the picture? That was what happened when I sanded--a rubbery chunk half came off, and pulled off other glaze with it. Oh yes, I rock, you can send me flowers and chocolates now). 3) When you eventually get your glazing technique down, don't let some weird black substance abruptly materialize in your glaze (or hairs, or dust, or all the other things you suddenly realize are floating around while your piece is air drying). 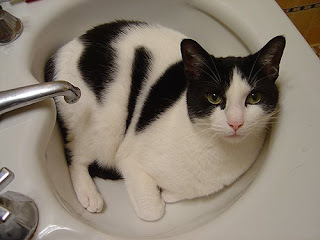 This cat, for example, was not supposed to have spots or a weird black haze. Okay, so this has nothing to do with cat-themed crafts--unless you count the fact that your cat would probably love chasing these dangly pretties--but if you like the goodies on the right then check out omglia's blog to enter her earring giveaway--my personal fave are the button earrings (picture removed since giveaway is now over). Whaddya mean it's not my bed? This is Zorro. I believe the message he was trying to transmit to me just before I snapped this picture was something like "wash your hands? in my bed? I don't think so..."
I'm debating whether or not to turn this into prints or cards or something like that in my etsy shop--any thoughts? 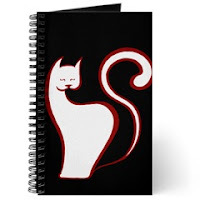 Zen Cat Journal: This journal, available only in the PurrPrints cafepress store, sells for just 12.99--and you get to choose the type of paper that goes inside (blank, lined, grid--even a task journal). Pointillist Postage Stamp: This is an actual postage stamp, available only at the PurrPrints zazzle store--order a pack of 20 for only 18.05 and send your mail in art-tastic style--stamp choices include standard first class stamps, postcard stamps, priority mail stamps, and a bunch more my pitiful brain can't recall right now. 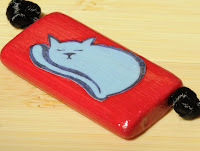 PurrPrints Magnets: These lovely magnets are only 4 dollars apiece and there's 10 designs to choose from in the PurrPrints etsy store, so why not pick up a few? 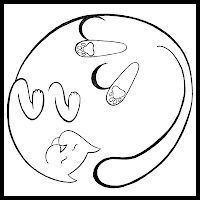 PurrPrints is the name of my line of arts and crafts, most of which are cat-themed (my cats own me--you can see the effects of their bossy...err, inspiration on etsy, cafepress, and zazzle). After much encouragement from a few wonderful etsians I've finally come around to starting a blog. However, even though I'm certifiably obsessed with etsy, cats, and art/crafts I'm also way too ADD to confine myself to those topics alone--so there will also probably be entries on everything from academia (I'm getting a PhD currently) and writing (I'm a total word nerd) to random new musical interests and the wonder of squidoo. I'll also try to be very responsive, so whether it's comments, entrecard drops, or requests, you can expect to hear back from me.